Alum: an astringent, crystalline, double sulfate of aluminum and potassium, widely used in medicine, manufacturing, and the arts. It is quarried and imported from China. TAWAS (alum) has found many applications, both urban and rural. In the urban-suburban areas, it is used as an axillary deodorant, as local therapy to herpetic sores and a variety of pruritic or irritated skin disorders, as a laundry scent, and as a preventive measure for excessive sweating of the hands and feet. In the rural areas, its use is in the purview of the albularyo for a variety of febrile conditions, a child's incessant crying or failure to thrive. In these situations, the use is ritualistic. The TAWAS is used to 'cross' (sign of the cross) the forehead and other suspicious or ailing parts of the body while prayers are being whispered (bulong). It is then placed on glowing embers, removed when it starts to crack, then transferred to a small receptacle of water. As it cools, its softened form spreads on the water surface and assumes a shape that may suggest the cause of the illness, often one of several indigenous forces: dwarfs, devils or other evil spirits (na-nuno, na-kulam, na-demonyo). The water in the vehicle is then used to anoint the ailing part or parts of the body to counteract the evil forces or illness. The tawas is then discarded and thrown westward, preferably into the setting sun. 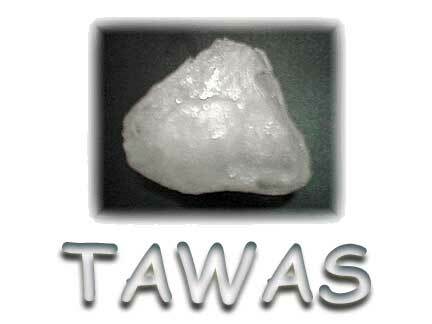 "Tawas" has evolved from its alum-based use to a diagnostic ritual utilizing non-alum materials as eggs, pieces of paper, cigarette rolling paper, fresh-water shells, candles, etc. A raw egg is cracked into a glass of water and the glass and the glass gently shaken, the egg white breaking and taking on unpredictable forms. The egg-white is examined for any change in shape that might suggest the nature of the illness. A piece of blank paper, about 4- by 4-inch square, whispered with prayers (bulong), is "crossed" over the body of the patient or over the area of affliction then examined for an shadows or shades for clues to the cause of the malady. Patients refer to this as "tawas x-ray." The paper is smudged with coconut oil; then the healer breathes on it while whispering his prayers chosen for the procedure. The paper is then brought up to a light to "read" the shapes that have formed that will suggest the diagnosis or cause of the malady. A lit candle is held close to a mirror and the healer reads the forms and shapes produced by the heat and smoke on the mirror surface. Or, a piece of candle is heated and melted on a spoon, then placed in water. The shape taken by the candle on the water will suggest the nature of the malady to the healer. Not infrequently, shapes of "dwendeng itim" (black elves) or forms representing evil spirits are seen, and treatments are so directed. Some arbularyos use tawas extensively, in diagnosis and treatment, even in the absence of the ailing patient who might be unable to make the trip to the healer. In his stead, a piece of recently worn clothing, usually a shirt or upper garment, is brought to the arbularyo. The healer crosses the garment with a small piece of tawas, then performs a "bulong" (whispers a prayer) on the tawas-piece, then places it on the edge of a small metal dish of fiery embers, intermittently sprinkled with ground insenso-kamanyang (a combination of chinese incense and tawas). The dish edge may contain as many as 20 pieces of tawas material, each from a different patient consulting for diagnosis and treatment. 10 to 15 minutes later, the tawas is lifted out of the smoldering dish and the arbularyo makes a diagnosis suggested by the shape the tawas has taken in the process of burning. The diagnosis, sans patient, may run a gamut of illnesses, from stomach ulcers, stress, infections, spells, goblins or other mischievoous and evil spirits. Depending on diagnosis, the arbularyo might prescribed prescription pharmaceuticals or, to counter spirits and spells, an olio of herbs or indigenous material, rest assured, empowered by anting-antings or incorporated with doses of prayers (bulong) and counterspells. A blue or green variety obtained from the Mount Banahaw areas, is believed to be specially effective in countering the effects of "lason" or "dawdaw." The source of the "poison" is from an egg that has been buried and allowed to rot for a year. The finger tip nail is scratched on the egg surface acquiring the "poison", then surreptitiously dipped in a glass of beverage, water or alcohol. "Lason" (poison) or "dawdaw" (dipping) is manifested with acute upper gastrointinal complains of nausea, vomiting and abdominal pain. The malady may also be induced by a cigarette that has been "poisoned" on the puffing end. Green or blue tawas is ground and mixed in half a glass of drinking water and drank. Easily available in local market places; a fist-sized rock costing about P10 ($0.25). Advertised in glossy international catalogues for $8 to $12.